RPM: 3450 Size: 35" x 24" x 35"
SMART CUT™ Masonry Saws provides a very inexpensive way for fast, and easy cutting of large variety of materials (when using the right diamond cut off blade). We can provide the right blade to best fit almost any application. From stone, ceramic, glass, brick, block, composite materials, metals, and etc. Fully automatic Precision Sawing machines usually cost several thousand and even tens thousands of dollars. Yet, most Advanced Material Manufacturing and R & D facilities very rarely require the functionality of high cost, automatic sectioning saws. 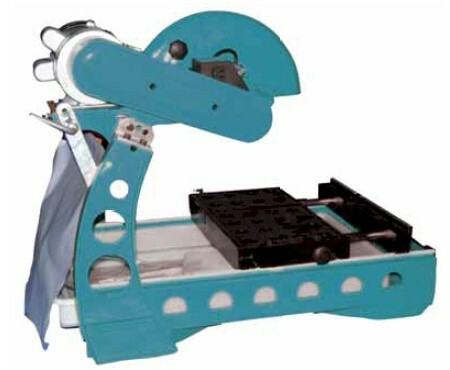 SMART CUT™ series of Precision Diamond Saws have been designed to provide the material researcher or engineer the same capabilities they would expect from high cost automatic sectioning saws, at literally small fraction of the price. Start Saving Money Today! We recognize that the Diamond Wafering / Sectioning Blade by itself is perhaps the most important factor in your sectioning / precision diamond sawing operation. The diamonds impregnated inside the bond matrix of the wafering blade, are what actually participate in cutting action. No matter how precision or well made your wafering saw. You will not be able to obtain the material surface finish, and precision tolerances you need, if the blade you are using is not right for your application. UKAM Industrial Superhard Tools proprietary blade chemistry, precision manufacturing methods, modern quality control methods, allow us to control and regulate the dozens of variables that affect blade life, quality of cut, surface finish. Reducing and often eliminating additional steps often required after sectioning. All blades are manufactured and available from inventory to fit your specific material, application, and surface finish requirements. We will work with you to determine your needs, and develop the right bond formulation, concentration, and grit sizes. SMART CUT™ Precision Diamond Wafering Blades are designed and specially selected to provide maximum possible blade life, for your desired cut quality and speed.